Dividing the year into four seasons is a tradition common around the world, at least outside the tropics, but most of us recognize that it’s an inaccurate system. Most of the rest of us find four too small a number and divide the year more finely. Anyone who lives north of the Gulf States and the southwestern deserts recognizes that “early winter” has a different feel—bright, clean, invigorating—than the dishwater-gray, when-will-it-finally-end? of “late winter.” Depending on how much farther north you live, you may be able to close your eyes, think of the first week of February, and remember how “midwinter” can also be separated from its bookends. Those of us who live east of California and south of Canada can divide summer in three as well. Naturalist Joseph Wood Krutch tripled the traditional quartet of seasons in his 1949 collection of essays, The Twelve Seasons. Every month strikes a distinctive chord, Krutch notes: “To me July and August, January, and February, have been [different] epochs, each with a character of its own . . .” Residents in New England, where he lived, should think of the year beginning in April, when the spring peepers call, he argued. August is exemplified by crickets; September by woolly bear caterpillars; November by squirrels preparing their winter hideaways. The New England year ends in March, by his reckoning, when the last pond ice thaws—the signal to listen again for the first peepers. Are you old enough to have learned in college that the Inuit language has 30 words for snow? Inuits—it was said—experience more sleet and frost than the rest of humanity, pay more careful attention to what’s blowing in the wind, and so have more words to describe different forms of frozen water than other cultures. Not too long ago, this particular aspect of the Inuits’ vocabulary was used to illustrate what linguists and anthropologists call the Sapir/Whorf hypothesis—the idea that language creates reality as much as reflects it. An Inuit notices more varieties of snow than speakers of other languages, the argument went, not only because he has more snow around him but also because he has more words to name its different forms. The 30 words create 30 separate realities. A Google search reveals that the Inuits’ 30 words for snow are now dismissed as an “urban myth.” The several peoples once called Eskimos speak different languages, not a common one, and have no more words for snow than other temperate zone cultures, it turns out. I was not a birder then, but I have thought of him and that lesson in the years since each of the too-few times a Cerulean Warbler has landed within sight. What would we call that beautiful animal if we lacked the word cerulean? Birders’ heightened sense of colors seems to support the Sapir/Whorf hypothesis, no? Who else but a birder can separate prothonotary from other forms of yellow? We recognize that shade only because we know the bird and its name. And how about vermilion, buff, roseate, and plumbeous? It’s unlikely that your bookshelf dictionary even has an entry for plumbeous, but birders who have chased the Plumbeous Vireo in the Southwest or the Plumbeous Kite in Central America know its definition. So, birding enhances our perception of colors. But we are even better with the seasons. All birders become phenologists—students of the seasons—without even trying. Here’s a list of seven widespread bird behaviors in scrambled chronology. Can you arrange them in the order they occur each year in your area? a) The first fledgling robins hopping here and there in your backyard, out of the nest but still begging from their parents. b) Male Mourning Doves cooing and pursuing females, while the females, not yet ready to be seduced, hustle away. c) Tree Swallows gathering by the dozens in “premigration” flocks on tele­phone lines—a mix of ragged adults, molting their wing feathers, and fresh-plumaged young of the year. d) The first northbound Osprey. e) The southbound return of the Dark-eyed Junco from its nesting grounds in the north to its wintering grounds near you. f) Male and female Great Horned Owls hooting back and forth—“dueting”—in courtship. g) The return of your favorite local-nesting warbler (you choose the species) from its wintering grounds to the south. 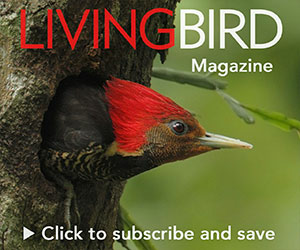 See the answers at the end of this article, and if you get them all right, as I believe most Living Bird readers will, the point is made: birders make good phenologists. Here’s a tougher task, though. Can you name the date (plus or minus seven days) when each of those events is most likely to occur in your particular locale? The right answers here will differ, depending mostly on latitude, but if you can assign those dates correctly—or come close—you are ready for the “How many seasons can you find next year?” challenge. In fact, you are ready for the challenge even if you can’t name those dates yet, but simply would like to be able to do it. Step 1) Find a big 2009 calendar with lots of space for notes and cross-outs. Step 2) Divide each month into thirds (1st–10th, 11th–20th); for the most eventful months—April, May, September, and October for the majority of us—you might even consider fourths. Step 3) Promise yourself that you will keep a focus in the upcoming year on the “ordinary” birding events, which are, of course, the thematic events of each period. Step 4) Write them down! Step 5) Look back as each period ends and find the most telltale birding event you have noted. What best illustrates the “season” you have just watched unfold? One other problem is that we lack a vocabulary for periods shorter than our months, which forces us to use phrases like “early spring” or “mid-March” when we talk about the timing of bird behaviors. These terms no more evoke the return of the Osprey than “light blue” describes cerulean. Why not invent your own names? “Osprey Back” and “Robin Nest” seem as appropriate on a birder’s calendar as “Grain Rains” and “Excited Insects” are on the old Chinese calendar. And naming them helps make them real. How many distinct periods can you identify: Twenty-four? Thirty-six? Fifty-two? Whatever your count totals at the end of the year, you will have stepped forward to a better understanding of birds, and it’s the kind of understanding we should all aim for if we want to call ourselves real naturalists. Anyone with a field guide, a pair of binoculars, and a modicum of experience can stumble on a late shorebird, a hard-to-find sparrow, or some other rarity. But only the best and most observant birders can chart and name all the seasons of the year. Go for it! Answers for most parts of the country: b) late winter; d) early spring; g) mid-spring; a) late spring/early summer; c) midsummer; e) mid-autumn; f) late autumn, early winter?